Mine are called The Tias. Yours may be called The YaYa’s or simply the Girls. In any case they are the trusted women who show up when life stinks and celebrate when it doesn’t. They are strong, loyal friends who think you’re beautiful in sweats but fully appreciate a sassy outfit or new tassle necklace. Last year when Tiff came to the pool in her fabulous find, an Old Navy striped bikini, Paige and I immediately ran out and bought the same one. Didn’t need to ask. The Tias know both the tenderness and selfishness of my heart and love me anyways. They aren’t afraid to tell me I need a haircut, nor would I be offended. They have earned that right. We have been friends for over 30 years. Longevity doesn’t necessarily elicit a deeper friendship but it sure keeps you from having to explain yourself. They know my stories…my failures…my hiccups. They remember…and graciously forget. They remind me of my strength and never withhold a compliment. Life’s too short not to celebrate one other. After I had my 1st miscarriage, I intended to grieve with a glass of wine while watching the red carpet of the Oscars. Some of the Tias drove 6 hours in black tie gowns to surprise me just before it began. They fed me cookie dough off a silver platter and carpeted my floor with red towels so I too could walk the red carpet. We chatted about our favorite dresses and hair styles, and then sobbed during commercials over my empty womb…then they drove 6 hours home. Loyal! Dependable! They show up when it matters! We laugh hard and cry easily, often at the same time. We help each other embrace our imperfections as women, wives and mothers. This past week we were able to all be together. I returned home yesterday refreshed and inspired by these amazing ladies, their spouses and children. They fill me with JOY. My prayer is that my daughter too will find these special relationships, ones that don’t judge but can ask the hard questions. Friendships where competition and insecurity are replaced by encouragement and trust. I desire for my daughter to truly know how to celebrate other women because once that is mastered, a Tia has been made. True girlfriends are those who will tell you the good and the bad. And find a way to make you feel OK about both. Your best friend may have other friends too. That’s ok.
A girlfriend understands that we all want to feel celebrated on our birthdays. Girlfriends come in all colors, shapes, and energy levels. Don’t have a type. You will miss out. We are all imperfect people. Your friends will disappoint you. Forgive them even before they ask. True girlfriends are those who meet you in the middle, and sit with you if the moment calls for sitting, and walk with you when you can move forward again. Be brave enough to be real. Your Authentic self is enough. You know she’s a true girlfriend when you don’t clean up before she comes over… you’re comfortable allowing her to see YOU, mess and all. A lack of phone contact should not breed insecurity, just an excitement for when you finally do connect. Pick up where you left off, no guilt or hesitation. Life is hard and we all know it. Grace should be freely given. Life gets busy though. Be intentional. Love them well. That will look different for each friend. Truly good friends are your best cheerleaders– they make you feel like everything you want is possible. If you find a friend that can make you laugh so hard you pee….don’t let her go. There are no gasps or judgement when your child has a meltdown in front of her. Just a chuckle and a story about when her own child slapped her mother-in-law in the face. Always reach out to the new girl in school or life. Always. A phone date together with a glass of wine and sleeping children can be as fulfilling as a dinner out. True girlfriends are those who take and give in equal measure – but always remember to measure over the length of a yard and not over the length of an inch. There’s a fine line between sharing information and gossiping. Don’t cross it and ask your friends to do the same. You can make a friend feel loved by loving on her children. It is a blessing to have an intimate few but always have room at your table. Be the anti-clique clique. Don’t be a high maintenance friend, life’s hard enough. Just love well and often. Laugh and cry together, often at the same time. Don’t flirt with her boyfriend, spouse or love interest. Remember your life and family are not supposed to look like hers. You were created differently. Don’t compare. Friends should never feel like an obligation. When you know you are crazy, your girlfriend can assure you, you are normal, even though you are crazy. A girlfriend understands your hormones, at all the different stages of womanhood. True girlfriends always know how to point out the best in each other. Apologize when you screw up, because you will. Don’t just say you’re going to pray for her, actually pray, even when she doesn’t ask. Know the purity of her heart. It’ll make it easier to give her the benefit of doubt. Give of yourself expecting nothing in return. A true friend will reciprocate when she is able. You have been placed in each others lives with great purpose. Cherish each other. I’m grateful for my readers and would love to have you follow The House of Hendrix below. If you would like to connect further, please join my FACEBOOK COMMUNITY or find me on PINTEREST. This entry was posted in blog, Favorites, kids, Motherhood and tagged character-building, girlfriends, lists, marriage, parenting. Bookmark the permalink. This is a beautiful post, Ali! I hope you don’t mind if I “steal” it for my own daughter :-). You have such a beautiful heart…it resonates right through my computer screen! If a list could be poetry, it would be this. Thank you for your sights so eloquently said. My favorites are #17and #35. My group is called the TEBS (talking eating bible studiers). We have all know each other about 30 years. For the period of time our children (there are 9 of us) were growing up we met weekly. Now our children are married with children of their own. We used to all live in the same community but now all but 2 have moved away. But we get together for lunches and retreats whenever we possibly can. Your list hit the nail on the head. I have 2 daughters who are married with children now and I am praying for them to find their group of girlfriends. Thank you! Not necessarily true. I had a “best friend” for over 50 years. At the time I needed her most, while my husband was dying, she dumped me, without any explanation. So did her entire family, which were just like my family, and mutual friends. Are you over it? Because you just took the time to comment on this beautiful message with negativity. This should have encouraged you. I imagine that if you were over it, you would have been able to get some sort of closure at some point. But alas, you are not over it. It’s hard to overcome something like losing a friend especially a friend as near and dear as a best friend. I hope this happens for you soon. Just because someone comments on something does not mean they are not over it. Wow, and you responded to this person with negativity, and who are you to decide what it means to be over aomething? Very judge mental aren’t you? You sound like you would be a great friend. Me, I don’t trust most women. They are surface, passive/aggressive and hurtful. Kind of like your comment. the worst kind. My daughter was killed, my son murdered .My husband died all fairly close together. I had some friends that were there for a period. Then it seemed to become to hard for them…. I am so sorry for your many losses. I can not imagine your pain, nor how difficult it would be for a friend to watch you endure such tragedy. I wish you had had more support. How are you now? My daughter died just over a year ago. I had friends that stayed for a little while and walked when it got hard, I had a few friends who never bothered to attempt support…but my god, I had some friends who rallied, who have loved with all they have, who mourn as if she was there own and who never ever judge me for my short comings, my anger and my bitterness over my loss. I could only pray that everyone finds the comfort of that in at least one person. I got goose bumps reading your message Ashley. Thank you for sharing about the loss of your daughter and the gift friendship was to you through those that repeatedly showed up. What a gift! Sherry, I’m so sorry this happened to you. It’s all too common. Unfortunately, sometimes we find out who are true friends are. Or aren’t. I’ve been through this kind of thing as well. I moved on eventually and found out that people I considered “acquaintances” were really my true friends. And no, you don’t “get over it”. You simply move on as best you can. I too had my best friend betray me after 21 years of friendship. It took about 6 years to get over. Then I realized, if she hadn’t betrayed me, I wouldn’t have made the time for my other friends. For the past 10 years there’s 10 of us that go away twice a year together. I’ve became close with those girlfriends who cherish and accept me for who I am. True friends are hard to find, but whatever you do, don’t stop looking. Sometimes we just have to open our eyes a little wider. It’s an honour to be friends with good people. One of the ladies is fighting pancreatic cancer right now. It’s devastating to lose her. She is such an amazing, funny woman. I’m so so thankful, I reached out to her all these years. She showed me what a true friend is. I will cherish her forever. Wow! You are an example of the reason I don’t trust most women. You think you are being a good person, defending the main post, but are actually being horrible and nasty. Call her. It’s never too late to talk to a good friend. Learned that one the hard way. Can I be adopted into the Tia group? This is as fabulous as you are! I am blown away by this post! Thank you so much. I am printing this out immediately and giving it to my daughter. So True. So Rare. Those That Have Friends Like This Are Richly Blessed! I’m lucky to have a group of friend just like the ones you describe. Everyone should! Thanks for posting this!! So incredibly beautiful! I love your writing style and way with words. Any chance I become a Tia? Also, are you wearing a tassle necklace in the picture? I tried to zoom in but couldn’t quite see. I googled them and they are adorable! How does one get to hang with the Tias? Timeless wisdom. Sadly, I don’t have a daughter, but I am blessed with several dear life long friends. Thank you for reminding me how precious they are.. I am blessed to have a group like this. We call ourselves the PMS or “Square Table” Group (because what’s said at the “square table” stays at the square table). It may have taken me until I was 43 to find a group of friends like this, but I treasure every moment of my time with them! Yes, I’ve had great friends along the way, but this group is extra special to me. Thanks for sharing this blog! I am blessed to have a few Friends that I can truly count on, and they can count on me. I Thank God for each one of them, they are also my Angels. I like this a lot, but as a queer woman, I flinch a bit at the term “girlfriend” used to mean friend, because it’s ambiguous at best. If you intend the ambiguity, great! (In fact, my girlfriend (the one I’m in a romantic relationship with) calls me her girlfriend in front of her homophobic grandmother, precisely because she knows that her grandmother thinks she means gal pal). But the flip side of that is that it can contribute to heteronormative assumptions — assumptions that everyone is straight, and we are all hanging out with our straight friends, who we love like sisters and love more than our boyfriends/husbands but not romantically or sexually because haha, no. What great thoughts, beautiful list. Your friends are so lucky to have you! One of my biggest regrets from high school is forgetting my gal pals to hang out with the guys. I of course have a few close girlfriends but most are from college or relatives. 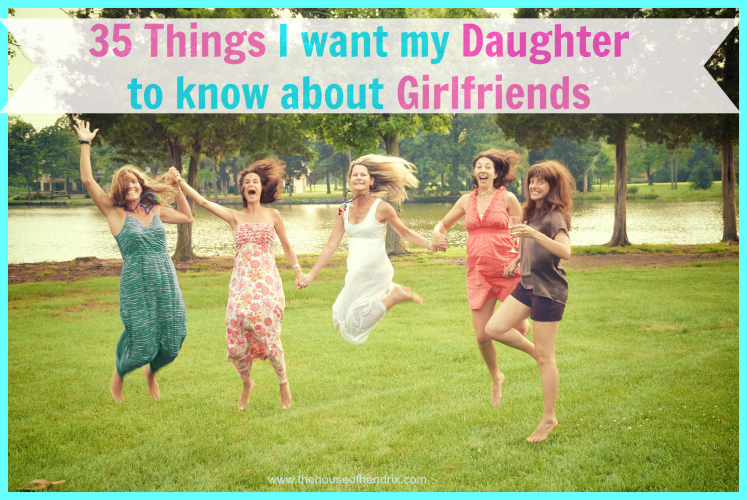 I will certainly be hanging on to this list to pass on to my daughter. A friend of mine shared this post with me and I feel so happy to have read it – thank you! You have shared so many wonderful truths. Wonderful. Thank you Miriam for sending this to me. I love it because I’m lucky enough to have the same kind of Friends. Always there for each other. Love and appreciate the girlfriends in my life! Best one of these types of lists that I have ever read. I too hope my daughter has such great friends and is a great friend to others. Thanks so much for taking the time to post this fantastic list. I love this post. I happen to write a similar post this week on my blog. Real friends are hard to find, I am fortunate to have a wonderful group of them. Thank you for the beautiful message. Love this…my group is VSAR (Victoria, Samantha, Amanda, Rachel) we’ve even got a necklace we send to each other (like the Sisterhood of the Traveling Pants), while none of us have children of our own yet, I certainly hope and pray we all have kids who know the importance of true friendships. What an inspiring post and something that rings true to my dearest friends! 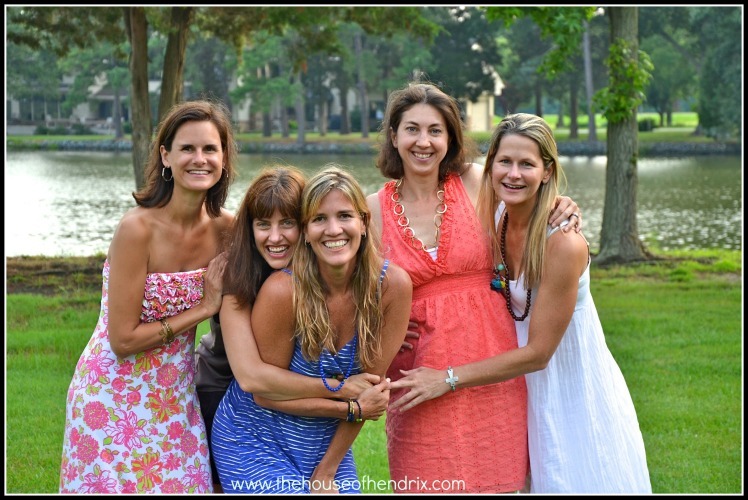 CRAZY how universal your story is…we are a group of 5 woman (college roomies). We created our name “The Cougars” from a funny incident over 15 years ago and it stuck! We mark our calendar each year for 2 organized get togethers and no one has ever missed since 1997. We have traveled cross country to celebrate and support one another. These woman are like sisters to me and I can’t imagine what life would be like with out them! Thanks for your beautiful post! I wish I had friends like that. Would be nice. I wanted to thank you for this beautiful post!! I found this on Pinterest and I was hysterically crying, because it was so true of my best friends and I. I too pray that my daughter finds the friends that I have been fortunate enough to have! We call ourselves the UPB 😉 All of our children were asking how all of their “Aunts” are related to them… we told them by love! Ali, I love this post so much! I’m going to feature it on my Two Cannoli page on Facebook this week, so I’ll tag you. My girlfriends mean the world to me. I would be completely lost without my girlfriends. This is a beautiful post. Thank you! That makes two of us! I wish I had this too. We were made for community and life is lonely without one. Hugs! I truly treasure my friends! They are so necessary in my life and we love each other dearly. We are “The Committee”. This is a great post and so true…a great girlfriend or friends are the most treasured possession you can have and you can never get too many friends. When you lose one of those friends it is never the same anymore…..I am so proud that my daughter has friends like this that are there for each other thru thick and thin,,,,and I must say I have a friend that has been there for me for years…altho we lost contact for awhile I always knew that she was there and if i needed her or she needed me we would be there for each other…that is a treasure in its self…thanks for sharing this post….. I have three beautiful girls, excited to share this with. Such a wonderful post! I have friends like that and I cherish them. This is so well said and written! Thank you! This post is absolutely perfect and so, so true. True friends are more like sisters, and I can only hope that one day, when I have a daughter, she is lucky enough to have a group of girlfriends as wonderful as the ones I have. Absolutely beautful. If it didn’t have the religious undertones, it would be the perfect. I love this post. Probably because I have a similar group of women in my life. We all ourselves the Round Robins after our Round Robin Letter – started in 1988 – and which continues to make the rounds to our homes. We’ve been a cohesive group since we were in high school although some of us have known one another since the church nursery in the 1960s. I am in my 5th decade of friendship with some of the Robins. Truly blessed to have them in my life. This is a beautiful post. Well said with insight and a loving spirit. Thank you. Great list. Love them all! This blessed me thank you! Love your blog. Thanks! So glad you were blessed. Come back and visit. I loved this!! Having lost my son two years ago I really learned who was my friend and who was not. Probably the hardest thing to go through and the women who told me call me anytime I dont care if it is 2 in the morning and really meant it are my real friends. I’m so sorry for the loss of your son. I’m also thankful that some amazing friends have been put in your life for those moments when you need to lean on somebody. May you find comfort in this long journey of grieving your loss. Love this post! Such a good reminder for young and old. Fantastic! I love my girlfriends. Don’t know where I would be without them! Thanks Amy.I was just told today is National Girlfriends Day (yes, it’s apparently a real holiday) so reading this today was on trend with the calendar. I love my girls as well. Thank you for a wonderful lesson! This has been flying all over the Internet because it is so spot on! I find #4 slipping into my conscience throughout the day,not so much in a girlfriend way but in a daily living way. Just when I’m ready to judge someone based on their outward appearance, I remind myself, “PEOPLE come in all colors, shapes and energy levels. Don’t have a type. You may miss out!” I think to myself, who am I to judge? That strange looking person could be a very interesting person to know! Thank you for the perfect lesson! By the way, yourself is the first blog I have ever signed up to follow. You are so worth it! You made my day. Thank you! That was lovely! Thank you for your insights and thoughtfulness. This was fantastic! I have these friends. Some over 30 years. I love them with my whole heart!!! What a blessing!!!! For you and for me! Love this list, studying about how to be a grown-up girlfriend in Sunday School. I am going to use this to wrap up the final lesson. Thanks for encouraging us as we grow as girlfriends. What a great Bible Study topic. Women need each other and I would love to study female friendships through scripture. You have me thinking. Tanks for commenting. Let me know how it goes. This was a good list until religion was brought into it. You could modify the list to fit you and take what you can use. I’m not religious either. I am sure we all could add or delete a few lines based on our own personal experiences – but this is a great list and beautifully written. It’s not meant to be picked apart and over analyzed. Hi Jennifer! I missed the link up.Sorry. It appears closed. When does it open and I’d love to pop over and share. Thanks! The she-tribe sounds like a very healthy group. So many women have not been fortunate as to have lived in the same area their entire lives, or for the extended time period that seems to be required for these groups to form. For a group to allow new women to enter is a healthy attitude for all relationships that are touched in a woman’s life. 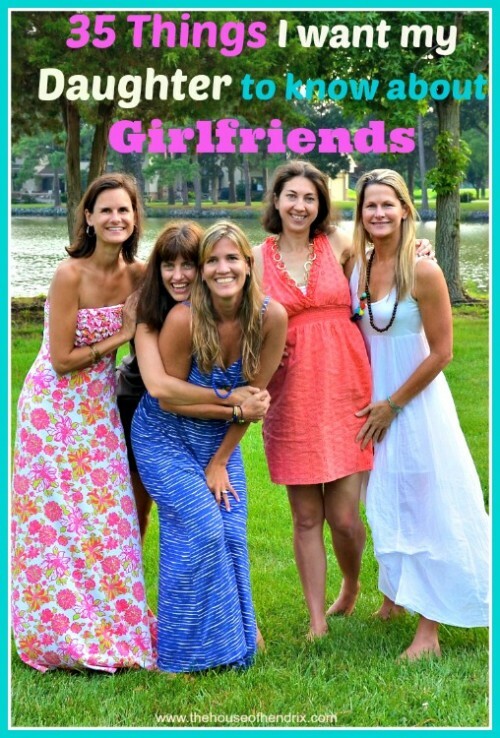 So many seem to be closed-groups and though they do have relatable experiences that connect them, they are missing out on giving and receiving they could be experiencing by connecting with new women that could use ‘girl-friend’ relationships. This sums up what real girlfriends are about. Thank you! I have five friends like this, we have been friends for over thirty years and whenever we get together which is not enough the time flies and wonderful times are had. Wouldn’t trade any of them for a million bucks. I am also lucky enough to have cousins like this too. Life is a true blessing when you have such wonderful family and friends. Thanks for the blog. I wish I had friends like this. I have tried and tried, but have always felt like an outsider. I have plenty of acquaintances but have never had this group of girls that I could just be myself with. Today I just feel like giving up on trying. I’m just so thankful to have an amazing marriage– my husband is truly my best friend. I do pray that my daughter finds a group of girls that will love her and accept her for who she is. So true. I have a great group of girlfriends and so glad that one of them became my girlfriend. I had a similar group of women “adopt,” me into their group this year. They couldn’t be more fun or supportive. We’ve taken trips together, had sleepovers in each other’s homes, and taken care of each other’s children. And, their friendship gave me the power to do away with a friendship that was not healthy. I love them all dearly and am so pleased to have been added to their group! Amazing post. I have friends, but am only sure of some as close. I got wedded some months back and although one supported me financially…they didn’t give me their best. They just sat the, danced a little…..and later said the were going. Under no circumstance will I act this way……I felt slighted, they never even appreciated or told me how amazing my wedding was. After the wedding, I have felt a little bit distanced from them, and feel the friendship should just be an occasional one, rather close. My daughter in law’s mother commented to her she thought it was “weird” that I have so many girlfriends and that we enjoy going on trips and out to eat without our husbands. She is missing out on so many blessings. Unfortunately she loves and supports her daughter conditionally and I am the one that her daughter turns to, I feel sorry for the woman. every day since i was a little girl did i ever want a best friend ! and believe it or not most of the little girls when i was very small were rude and mean and i was bullied badly!! all the way to tenth grade!still!!!!!!! i wish i had the insight to pick better! i feel as if i always get dumped! i am helpful, a listener ect… i know i am a good friend i have done many things for my friends and try really hard not to judge and take on too many at one time! because i feel like sometimes you have to be careful! you are all such a great example for other girls young and old! i want to thank you for making this story public and letting so many into your lives!!! i want a good girl friends so bad!!!! sad~~~~~~~~~~ i will shpow this to my daughters maybe the can do well!!! Thank you Susan for opening up and sharing your experience. 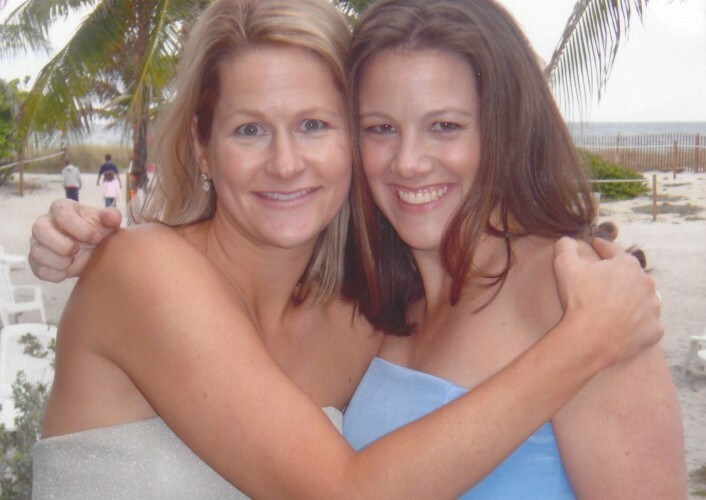 I tell my daughter the most important part of friendship is being the good friend, and Susan, it sounds like you are. I am sorry you were bullied. That is never ok and not a healthy relationship for anybody. You daughters are blessed to have had a mother who listens, is servant-hearted and values relationship. What a great model you have been. Maybe your best friends will turn out to be family. My mother is certainly that for me. I’m still looking for my kindred spirit too. I’m sure she’s out there. It was easier to find a husband that it is to find a new best friend. Love this post. I wish I had a group of friends like this. I am lucky to have a few girlfriends but sadly I’ve lost some too. I was always the single one with no kids and I would love on their kids and do for them like they were my own. Then I ended up having a child of my own. I was so happy to finally be blessed to be a mother. I ended up becoming a single mother after her dad walked out when she was a month old. I had postpartum depression for a year and lost everything. The one girlfriend that I thought would have been there for me wasn’t. She moved away and due to poor cell service and opposite work schedules we rarely got to talk over the next year. She moved back and I was so excited because I know lived closer than before and hoped we would reconnect. To my dismay I tried but the response I got back was she had a lot going on with having a preteen daughter and son graduating high school and they were more social than before so she didn’t have time for me. It hurt because I had been with her through her worst and known her since her daughter was 2. Thank you for sharing your experience. I can’t imagine having had to sort through a new baby…with postpartum….alone. Your plate was full and my heart breaks that you did not have the support you needed. As far as friendships go, I too have had friends at different life stages where we have drifted apart for a season. Some of my closest friends and I always seem to find our way back to each other….not though at my desired timing. I hope that happens with your friend because it sounds like you really care for her. I’m thankful though some other friends have stepped into your life. What a wonderful reminder of how beautiful friendships truly are. I have several girlfriends that a scattered around the world and they mean everything to me. Thanks for sharing this. I do have a a little girl to share it with, but I will share it with my girlfriends! I love this list! You really know the true meaning of friendship. I love the reminders about always having room at the table and being the “anti-clique clique.” A lot of women when they write about their friendships it seems to be more about excluding others and gossiping about those on the outside. This is what I want my friendships to be. A wonderful and true post. I can relate to this in every single way. Thank you for sharing this!!! Cherish them. It’s not as common as we’d hope. Is it weird that I cried a little reading this post and some of the comments? Not at all Paige. I cried writing it and got teary many times thereafter reading the stories from these women who have both treasured and terrible experiences. Both hit my heart. Great list! My girls are little and still jumping around friendships but I keep telling them how they will find that small group of friends that will follow and support them through life. I read your post and it brought me to tears. We are a group of 7 and have been friends for over 30 years. We have been on amazing girls trips where we laughed sp hard our cheeks hurt for days from smiling and we’ve helped each other through cancer or the loss of a child. These are the people that come and drop everything when you need them most. Yes we are all busy and a few of us live put of state but if someone needs something we are on the next flight out.